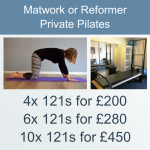 At Balance we run an incredibly flexible payment system for our Pilates Classes: you pay a fixed amount each month and this entitles you to your allocated place in your weekly class. However, we also run a SWAP and CATCH UP system so that you never have to miss your class. Balance is open for 41 weeks this year. Whatever day of the week your class is, you will receive 41 classes: all holidays, bank holidays etc are taken into account and are NOT paid for. We work out the annual cost of classes and then divide by 12 to get a monthly amount. This means that you pay the same amount each month, even though the number of classes per month may vary. Your direct debit can be stopped at anytime; you are NOT committed to any length of time. If you prefer, you can buy a 6 month or 12 month pass at a reduced rate.